D.L. Mayfield was 19 years old and she was going to be a missionary. But she quickly discovered that she wasn't very good at languages or asking random strangers what kind of God they believed in. None of the things she learned seemed like it would work with or help the people she encountered. Instead, she took a different tact: she started volunteering with the refugees who were flooding into her community. Eventually, she moved her small family into one of the low-income apartment buildings full of refugee families. And then she got to know them and let them know her. She stuck around long enough to be uncomfortable and offended and have her mind and her heart changed about just what it means to live as a person of faith and love your neighbor as yourself. This slim book is set up to imitate the cycle that refugees experience when they finally arrive in a new place: anticipation, reality, depression, and acceptance. Mayfield candidly lays bare all of the mistakes she made, big and small. I appreciated that she wasn't cruel to herself in retrospect; rather, she admitted that she had grown and learned a great deal over the years. There is a growing movement among Christianity that points out the inherent flaws in the concept of "short-term mission." This is the idea that you travel to a foreign country or the inner city for a week or two, do a program with the local children, build a house, and then go home feeling like you have made a difference. But Mayfield points out that this concept is damaging to both the people going and the people who are seen again and again as a problem to be solved with a skit and a free t-shirt. There is a difference between giving up a weekend and becoming truly invested in people. She writes that "the problems seem to get more overwhelming, the longer you stay. The easy paint jobs got taken, the kids already ate your snacks and heard the stories you had prepared for them, your friend never followed up on the job interview you arranged for him...If you stay long enough you will learn just enough about the brokenness of the world that you will feel completely powerless, mired in your own brokenness and doubting God more often than you care to admit. It is easier to leave right after the prayers are prayed, right after somebody meets Jesus, while the tears are still fresh and the hope is solid enough to cut with a knife...And then we forget. We always forget--that comforting, calming, after-effect of our world." 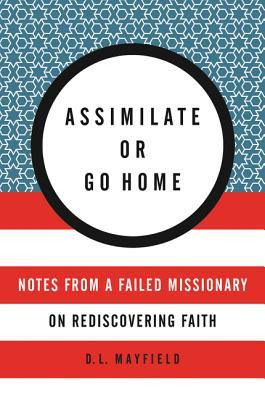 Assimilate or Go Home is one of those books that takes up permanent residence in your mind, so you can think about it months after you are done with it. I can't decide if I want to start loaning it out immediately to every person I know or keep it close by, so I can re-read it again and again. D.L. Mayfield certainly doesn't claim to have all the answers, but she has some ideas about what God might really be calling us to do. Perhaps you are being called to the ministry of baking cakes for people who are moving away, or sitting in silence with someone whose heart is broken, or allowing yourself to be vulnerable and helped by others, or just seeing that great injustice and the love of Christ somehow both live in this beautiful, broken world. This book sounds eye-opening. Along the lines of the old saying--paraphrased.. Give a man a fish and he eats for a day, teach a man to fish and eats for a lifetime? I'm not at all religious and don't even like the concept of missionary work, but this book sounds fascinating to me anyway. It seems like it would apply equally well to any volunteer work - long term investment in a community is surely more meaningful than volunteer tourism.